Finance Minister signs special waiver allowing US embassy to be relocated to Jerusalem in time for 70th Independence Day. 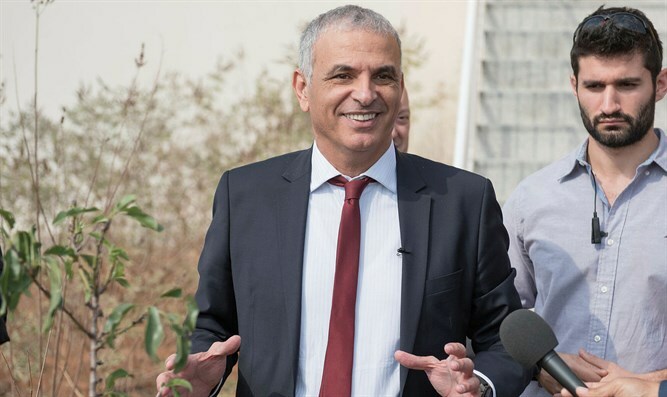 Israeli Finance Minister Moshe Kahlon (Kulanu) signed a special waiver Wednesday, permitting the US State Department to upgrade a facility designated to serve as America’s interim embassy in Israel. The move comes after US and Israeli diplomats expressed concern that plans by the US to relocate its embassy from Tel Aviv to the Israeli capital in time for the 70th anniversary of the establishment of Israel on May 14th were jeopardized by bureaucratic red-tape. Kahlon issued the waiver permitting the US to upgrade its consular facility in the Arnona neighborhood of Jerusalem to an embassy, hailing the move as a “historic movement”. “I’m happy and proud to use my authority as Finance Minister of the State of Israel to sign this order permitting President Trump to fulfill his promise to move the US embassy from Tel Aviv to Jerusalem,” said Kahlon. Last December, President Donald Trump ordered the embassy moved to Jerusalem, fulfilling his 2016 campaign promise to implement the 1995 Jerusalem Embassy Act, a bipartisan law requiring that the US embassy in Israel be located in Jerusalem, Israel’s capital city. Secretary of State Rex Tillerson initially claimed the embassy move would take roughly two years, but later backtracked and said that plans to complete the move in even three years were “ambitious”. In February, however, the State Department said that it would transfer its Israeli mission to Jerusalem in two stages. The first stage would see the US consulate building in Jerusalem’s Arnona neighborhood designated as the new embassy. Ambassador David Friedman’s office would be transferred to the Arnona facility, along with a limited number of other staff members. The remaining embassy operations would be relocated to the new embassy sometime around late 2019, after an annex to the Arnona facility is refitted to serve as part of the new embassy. US officials had set a May 14th opening date for the new embassy – coinciding with Israel’s 70th Independence Day. But US and Israeli officials later found that bureaucratic red-tape barred the necessary upgrades to the US facility to prepare it to serve as an embassy in time for the planned May 14th unveiling. State Department officials had requested permission to construct a roughly 10-foot wall around the new embassy building, as well as pave a new road to increase access to the facility. Director-General of Israel’s Foreign Ministry, Yuval Rotem, warned Finance Minister Moshe Kahlon (Kulanu) that without special dispensation from the government to circumvent the normal bureaucratic channels, the embassy cannot be opened by May 14th. Under normal circumstances, the US State Department’s request to rezone the compound to permit the alterations would require approval from the National Planning and Building Committee. Given that the committee’s next meeting is scheduled for April, the setback would likely preclude the possibility of opening the US embassy in Jerusalem in May as scheduled – an embarrassment for Jerusalem officials, who have for decades called for the US and other powers to relocate their embassies to the Israeli capital. On Tuesday, however, Israel’s National Planning and Building Committee recommended that the US consulate compound in the Arnona neighborhood of Jerusalem be granted a special exemption, permitting the US to upgrade the facility into an embassy in time for the planned May 14th relocation deadline. “The committee held a hearing to examine the planned improvements for the [future] US embassy in Jerusalem,” National Planning and Building Committee chief Dalit Zilber said Tuesday.